JEAcoustics is pleased to announce the addition of Cassandra H. Wiese to our engineering staff as Consultant. In this position, Ms. Wiese will conduct measurements, analyses, and engineering design for architectural acoustics, mechanical noise control, sound isolation, and environmental noise. Cassandra comes to JEA with experience in acoustics disciplines, including environmental, health care, research, mechanical equipment noise, sound measurement and architectural acoustics. Previously in her career, Cassandra served as and vibration field technician at ETS-Lindgren. She earned her MS degree in architectural engineering from University of Nebraska after her BS degree in physics-acoustics from Northern Illinois University. She also has an international MBA from Temple University and Ecole des Ponts Paristech, ENPC School of International Management. Jack B. Evans and Chad Himmel present "Acoustics for Academic Research, Healthcare, and Residential" along with Guillermo Ramos, Director of Capital Improvement Projects at UT Southwestern Medical Center at the TCUF 2014 conference in Dallas, October 1st, 1:00 - 3:00 p.m.
On October 19, Jack B. Evans rides and raises funds for the Team LIVESTRONG Challenge Austin. At the starting line, Jack waves before beginning his 45-mile ride. Chad Himmel discusses "Noise and vibration control in residential projects" at the Austin Energy Green Building Acoustics seminar in Austin, July 18th, 11:30 a.m. - 1:30 p.m.
JEAcoustics has moved to a new location! Our new address is 4407 Medical Parkway, Austin, TX 78756. All phone, fax, email and internet contact info remains the same. 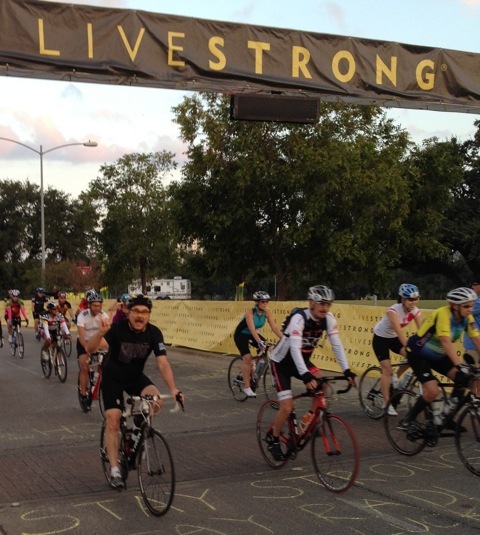 On October 21, Jack B. Evans rides and raises funds for the Team LIVESTRONG Challenge Austin. Here, Jack holds the yellow rose that he received at the finish line. Jack Evans co-chairs session 3.14 "Vertical transmission of noise and vibration" and will present the paper "Vertical transmission of vibration and noise to a research laboratory from mechanical equipment room - analysis and mitigation case study" at Inter-Noise 2012 in New York City, August 19-22. JEAcoustics is pleased to announce the addition of Mark L. Leger to our engineering staff as Consultant. In this position, Mr. Leger will conduct measurements, analyses, and engineering design for architectural acoustics, mechanical noise control, sound isolation, and environmental noise. Mark comes to JEA with three years of experience in acoustics disciplines, including environmental transportation and mechanical equipment noise, sound measurement, and architectural and industrial acoustics. Previously in his career, Mark served as acoustical consultant at Acentech in Westlake Village, California, and Acoustical Design Collaborative in Towson, Maryland. He earned his M.A. in Audio Sciences from The Johns Hopkins University Peabody Institute in 2007 and his B.S. in Chemical Engineering from the University of Texas at Austin in 2001. Rice's Brockman Hall for Physics Wins TSA 2011 Design Award. Brockman Hall for Physics (Houston), which opened this spring, was one of 12 projects recognized in Texas Society of Architects' annual design awards program. JEAcoustics is proud to have participated on the design team with Kieran Timberlake, providing acoustics consultation, noise control, and structural vibration control for sensitive labs and equipment. Tellepsen YMCA Wins Green Building Award. Texas Construction awards the Tellepsen Family Downtown YMCA project with an Excellence in Green Building Award in their Best of 2010 program. The project will be a LEED certified facility, pursuing LEED Gold, and will be the 1st YMCA facility to earn LEED certification. JEAcoustics is proud to have participated on the design team with Kirksey Architects, providing acoustics and noise and vibration control for the new facility. JEAcoustics is pleased to announce that Joshua Leasure received his Texas State Professional Engineering License in December. Josh joined JEAcoustics in 2008 and currently conducts measurements, analysis, and detailing for architectural acoustics, sound isolation, mechanical noise control, and environmental noise. He has a Bachelor of Science in Mechanical Engineering from the Colorado School of Mines. Jack Evans presents "Reduction of tonal noise in lecture room air conditioning supply ducts" at INTER-NOISE 2009, the International Conference on Noise Control Engineering in Ottawa, Cananda. Jack Evans presents "Acoustical Corrections Case Study for Open and Closed Offices" at ICSV 16, the 16th International Congress on Sound and Vibration in Krakow, Poland. Chad Himmel presents "Mechanical equipment and ambulances. Strange bedfellows of cardiovascular services" on May 21 at the 157th Meeting of the ASA, Portland, Oregon. Jack Evans presents "Case-Study on the Noise and Vibration Design for a Pediatric Research Facility" at ASHRAE Winter Conference, Chicago. The article, "Developments and Trends in Acoustics and Noise Control," written by Mindi Zissman based on an interview with Jack Evans, appears in Architectural Products magazine. JEAcoustics is pleased to announce the addition of Joshua Leasure to our engineering staff as Consultant. In this position, Mr. Leasure will conduct measurements, analysis, and detailing for architectural acoustics, sound isolation, mechanical noise control, and environmental noise. Josh comes to JEA with five years of experience in acoustics disciplines, including environmental noise, sound measurement, and architectural and industrial acoustics. Previously in his career, Joshua served as an Associate for Veneklasen Associates in Santa Monica, California, where he worked as a consulting engineer on a variety of projects. Prior to that, he served as an Acoustical Engineer for Hankard Environmental, an environmental acoustics firm in Fort Collins, Colorado. Before entering the consulting industry, Joshua studied miner hearing safety at the Colorado School of Mines' Western Mining Resource Center. Jack Evans co-chairs a two-part session, "Noise, vibration and acoustics for medical and research facilities and their occupants," where he also presents his paper, "Nanotechnology research facility—a vibration and noise control design case study." Chad Himmel presents his paper co-authored with Danny Kupersztoch, "Field airborne and impact sound insulation of wood truss floor systems." Jack Evans presents his paper, "Noise Control for Neonatal ICU for Demolition and Construction within Hospital Facilities," at Noise-Con 2007 National Conference on Noise Control Engineering in Reno, NV. Chad Himmel presents his paper, "Comparative Analysis of Retrofit Windows for Noise Control at a Hotel," at ICSV14 - the 14th International Congress on Sound and Vibration in Cairns, Australia. Jack Evans presents, "Protecting the NICU from Construction Noise," at the 20th Annual Gravens Conference on the Physical and Developmental Environment of the High-Risk Infant, USF Health, Tampa, FL. The article, "Standards for the acoustic environment of the newborn ICU," co-written by M. Kathleen Philbin and Jack Evans, appears in Journal of Perinatology. Jack Evans presents his paper, "Pneumatically Isolated Inertia Base with Active Damping for a Transmission Electron Microscope," at the 12th International Meeting on Low Frequency Noise & Vibration and its Control, Bristol, UK.